In partnership with 651 Arts & BRIC, Haiti Cultural Exchange presents Lakou Mizik! 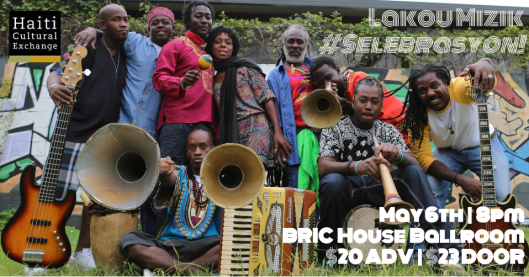 Lakou Mizik is a collective of Haitian musicians who are bringing new life to Haitian roots music with legends like master drummer Sanba Zao, and young stars like Steeve Valcourt and Jonas Attis. A thrilling, genre blending musical experience that is as hard to define as it is easy to love – African, French, Caribbean and American influences collide with stirring rhythms of Haitian vodou drumming, the french café lilt of the accordion and the joyful percussive punctuation of the Rara horns – all mixed with scrappy, socially-driven lyrics and a dash of Motown swagger. This show is sure to be a fun sweaty dance party! This entry was posted on Wednesday, April 20th, 2016 at 3:43 pm	and is filed under Events, HCX Collaborations, HCX Programs, Music, Selebrasyon!, Uncategorized. You can follow any responses to this entry through the RSS 2.0 feed. You can leave a response, or trackback from your own site.